After a number of tense qualifying soccer (football for everyone else) matches, fever reaches high pitch: Brazil World Cup 2014 is about to begin! With opinions varying wildly, everybody seems eager to guess the winner these days; worldwide punditry united, both amateurs and professionals, prominent and no-name experts, including betting shops and even Goldman Sachs analysts – they’re all racing to predict a winner. We’re taking a different approach, trying to synthesize a whole swat of forecasts (in no scientific manner), guided by the marvelous Philip Tetlock’s line: “The wisdom of crowds is an important driver of accuracy”. Served with some interesting facts (more info http://www.worldcupbrazil.net) about the competition, as usual … We invite readers to share their views: who’s the most likely winner of Brazil World Cup 2014? Most World Cup appearances (including 2014): 20 for Brazil (every tournament), 18 for Italy and Germany. Most World Cups won by a player: Pelé, Brazil in 1958, 1962 and 1970. Most tournaments in which a team was eliminated without losing a single match: 3 (England in 1982, 1990 and 2006). Most goals scored by a team in one tournament: 27 (Hungary in 1954). Hungary ended up runners-up to Germany that year. 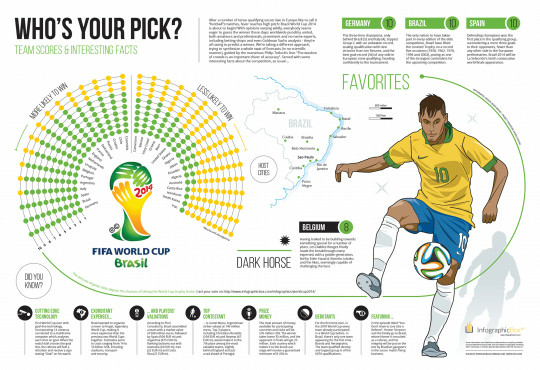 2014 World Cup -- Who's your pick?